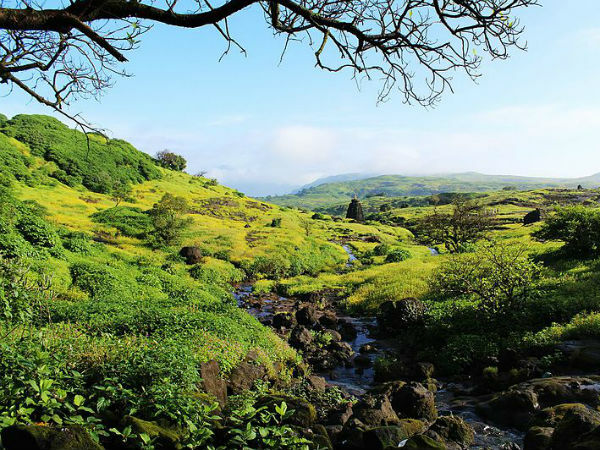 »Trek To The Famous Harishchandragad And Feel Your Adrenaline Rush! Trek To The Famous Harishchandragad And Feel Your Adrenaline Rush! Maharashtra is a state that is blessed with undulating landscapes, breathtaking waterfalls and lakes, peaceful beaches and majestic hills - it is a one-stop destination for everything nature has to offer! Naturally, the state has one too many popular places for trekking. One such famous and beloved trekking destination, especially to the city folks of Mumbai and Pune, is Harishchandragad. Perched at an elevation of 4674 ft, Harishchandragad is a magnificent hill fort, that dates back to the 6th century. It was a fort built during the rule of Kalchari Empire and was later taken over by the Mughals in 1747 AD. The fort was built since it served as a fantastic strategic location to guard the entire region. Harishchandragad has three major peaks namely, Rohidas, Harishchandra and Taramati. The Taramati Peak is the highest one of all, and is a popular point visited by trekkers since it offers a spellbinding panoramic view of the entire Konkan region. The post monsoon months of October to December are ideal to trek to Harishchandragad, since the rain-fed greenery that surrounds the region will look absolutely stunning. The monsoon months of June to October will also be spectacular to view the hill fort, but it might be hard and dangerous to trek during this season. Read about the places to visit on the way to Harishchandragad. Thane is a district and a city located 23 km from Mumbai. This is the first place one shall encounter while on a road trip to Harishchandragad. Thane is fondly known as "The City Of Lake" since it has over 30 serene lakes dotted across the city. Upvan Lake, however, is the most famous lake of Thane where cultural activites regularly take place. Apart from lakes, Thane is surrounded by many amusement parks, ideal to spend time with the kids. While Harishchandragad is one of the famous places for trekking, Asangaon's Mahuli Fort is another place that is sought after by trekkers. Mahuli Fort is located about 56 km from Thane and is often visited by adventure bugs from Mumbai, Thane and Kalyan. Two or three hills of this undulating landscape share a pinnacle. Mahuli Fort, which is now in ruins, was built by the Mughals, and stands at the highest point of Thane district in Maharashtra. Located at a distance of 58 km from Asangaon, Igatpuri is a quaint and less-explored hill station of Maharashtra. Igatpuri has many peaks, viewpoints and picturesque natural resources, that makes it your perfect getaway. Some of the popular places visited by tourists in Igatpuri are the Camel Valley, Bhatsa River Valley, Tringalwadi Fort, etc. It also has quite a few trekking trails such as the Bitangad Trek and Kulangad Trek. Bhandardara is a beautiful hill station that is nestled in the depths of nature and surrounded by breathtaking waterfalls, forest thickets, lakes and dams. It is located around 70 km from Igatpuri. Some of the most popular places to visit in Bhandardara include Wilson Dam, Arthur Lake, Ratangad Fort, Umbrella Falls, Amrutheshwara Temple, etc. Read further to know about Harishchandragad Fort and trek. Located at a distance of 50 km from Bhandardara, Harishchandragad is an ancient hill fort of Maharashtra. As previously mentioned, Rohidas, Harishchandra and Taramati are the three main peaks, which offer beautiful panoramic views of other popular trekking points such as Malshej Ghat, Naneghat, etc. The Harishchandragad Fort is surrounded by caves, temples and a pond, about which you will read further in this article. These are the different trekking routes that can be taken to reach the fort. There are three main trekking trails to reach the fort. The trail that begins from village Pachnai is the easiest of the three. It takes 3 hours to reach the top and almost the same time to return. Carry packed lunch which you can have once you reach the peak. The trek will take an entire day, and is the ideal place to start trekking for beginners. Khireshwar Village is the base camp to this trail. It is a one-day trek that takes about 4 hours to reach the top and 4 hours to return. This trail has a medium level of difficulty. People who are fit or are accustomed to trekking, will find it easy to transcend this trail. This trail is also the most sought after since it provides exceptional vistas of the nature that surrounds the region. The hardest trek of the three mentioned trails, is the trek via Nalichi Vaat. This trek will take two days and a night to complete. A camp can be set up for the night at the peak. To trek through this route, you will have to begin as early as 6 -in the morning. This way, the top can be reached by 4 pm, with a pit stop at the water stream called Nali. The base camp of this trail is the Belpada Village and the end point is Konkan Kada, which is a huge cliff that offers breathtaking views of the Konkan. To watch the sun rise or set from this point is an indescribable experience! Read about the places that can be found while trekking to the hill fort. Once you reach the temple, you can visit the Harishchandreshwar Temple. It is a classic example of the artistry that goes into carving sculptures out of rocks. The temple has an entrance from all the four directions. The main entrance is decorated with sculptures of faces, which are believed to be the faces of the temple's guards. The architecture of the temple-top resembles the construction of temples built in North India. The Kedareshwar Cave is an interesting place located on the right of the temple. It is a huge cave that houses a 5 ft tall Shivlinga. The idol of Lord Shiva is completely surrounded by waist-deep water. Since this water is ice-cold, it is hard to reach the idol. The idol is surrounded by four pillars which is believed to represent the four Yugas. According a local legend, the world will end when the last pillar standing breaks. Apart from this, Harishchandragad is dotted with a number of other less-explored caves. Saptatirtha Pushkarni is a small and serene pond, situated close to the temple. The water of this pond remains ice-cold even under the scorching heat of a hot summer day. However, due to negligence in maintenance, the pond has now been polluted by tourists.